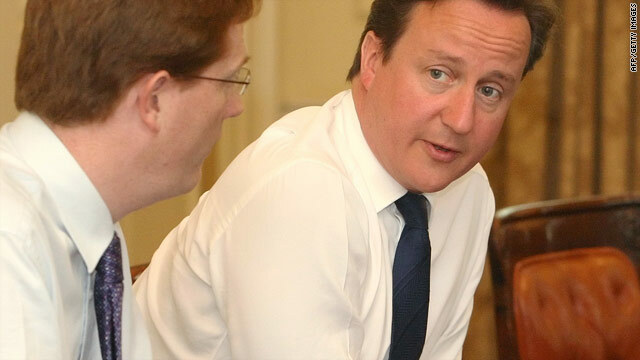 British PM David Cameron talks with Chief Secretary to the Treasury Danny Alexander in London on June 21, 2010. He says summits should be "more than just grand talking shops"
Toronto, Canada (CNN) -- Describing himself as the "new kid on the block," British Prime Minister David Cameron said this weekend's G8 and G-20 summits in Canada should be about "more than big talk." In an op-ed in Friday's edition of the Canadian newspaper The Globe and Mail, Cameron said such international summits often "fail to live up to the hype and the promises made" despite the cost and good intentions. "Somehow, those intentions rarely seem to come to fruition in real, tangible global action," Cameron wrote. "When we meet again a year later, we find things haven't really moved on. So the challenge for the upcoming G8 and G-20 is to be more than just grand talking shops." Cameron said the leaders at the summit in Ontario's Muskoka region need a "tight focus" on what they want to achieve and must be willing to be held accountable for their promises. Leaders must drive their priorities through "relentlessly" year after year. Disagreements are already brewing ahead of the summit over how the global economy's fragile recovery should best be steered. The United States has been urging other countries not to pull back on stimulus plans too quickly, while Britain has recently joined other European countries in announcing drastic budget cuts to curb mounting public debt. "Fixing the global economy" should be the summits' first priority, Cameron said. He called for flexibility in how countries act, taking into account their national circumstances, but said each nation must lay out plans for getting its finances under control. Cameron also said countries should introduce a levy on banks to help repair the damage caused to the global financial system. France, Germany, and Cameron's own government in Britain are introducing such measures. The British leader said he realizes "this approach won't necessarily be for everyone" but considers it "fair" that banks be saddled with the cost. The real stimulus that economies need, Cameron said, is trade. He called for countries to cut red tape and have the "political will" to boost trade. "Trade is the greatest wealth-creator ever known," Cameron wrote. "It has lifted billions out of poverty. It enables people in Muskoka to make money in Mumbai -- and vice versa. It spreads knowledge, ideas and products -- and ultimately improves our quality of life." Cameron said streamlining customs red tape, reducing congestion at ports, and improving transport infrastructure could save time and money. "Don't underestimate the difference these changes could make," he said. "When a U.K.-funded 'one-stop border' post replaced entry and exit checks between Zambia and Zimbabwe a few months ago, waiting times for truckers dropped from three days to three hours." Britain is now supporting eight new such posts across Africa as a way to spur trade between developing countries, Cameron said.